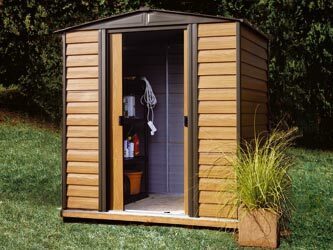 A perfect alternative to timber these Woodvale Metal Sheds are fire, rot and rodent resistant, a low maintainence choice of garden building. Supplied pre-painted coffee coloured with attractive wood-grain shiplap look panels. and includes double lockable sliding doors (padlock not included). Floor not included. Supplied flat packed with easy to assemble instructions and supplied with fixtures and fittings.